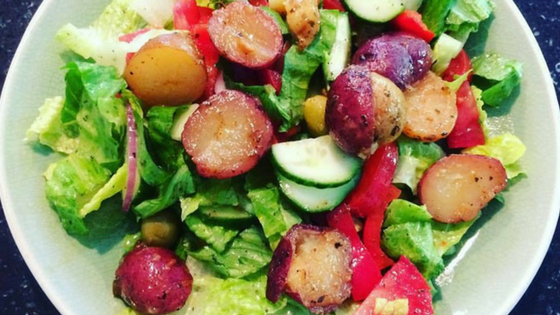 A lot of health coaches will tell you to give up potatoes and other starchy foods. Not this health coach. Yes, potatoes are higher on the glycemic scale, however when paired with low glycemic greens, it all balances out. And, they are Mother Nature foods, grown from the earth, so I’ll keep eating them before any packaged goo claiming to be healthy. These are a healthier twist on restaurant Greek potatoes. Mix everything together in a baking dish, cover and bake for 40-minutes or until tender, stirring them halfway through the cooking time. Note: You can cut the potatoes in half or leave them whole. If left whole, they will take a little more time, so allow for another 20 to 30 minutes. These are great on the BBQ too. Follow the same directions, but wrap in tin foil packets and cook on the BBQ for 40 minutes. Top them on your favourite salad, with a homemade vinaigrette and eat.